We always go for the best result. Welcome to a strong and efficient company, which can perform your tasks perfectly. We are known for our creative solutions, our high quality and our competitive prices as well as for always keeping schedules and agreements. P.K. Jeppesen & Søn A/S is proud of its long tradition. We use our experience and our know-how to realise innovative, customized solutions. To us, it is a matter of course that we always go for the best result; we do so in each project! We realise the projects in close co-operation with our customers, from the original idea to the implementation and acceptance of the finished product. P.K. 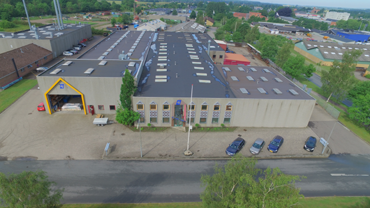 Jeppesen & Søn A/S has a 4400 m² big production area, state-of-the-art machinery, which includes many special-purpose machines, and 50 committed employees, who always make their job perfectly..